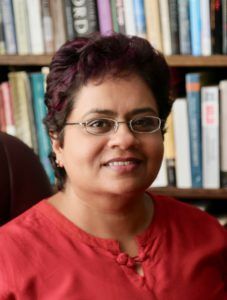 Susan Abraham is Professor of Theology and Postcolonial Cultures, VP of Academic Affairs and Dean of Faculty at the Pacific School of Religion. Her teaching and research explores postcolonial religious practices. She is the author of Identity, Ethics, and Nonviolence in Postcolonial Theory: A Rahnerian Theological Assessment (Palgrave Macmillan, 2007) and co-editor of Shoulder to Shoulder: Frontiers in Catholic Feminist Theology (Fortress, 2009). Her publications and presentations weave practical theological insights from the experience of working as a youth minister for the Diocese of Mumbai, India, with theoretical perspectives from postcolonial theory, cultural studies, and feminist theory. Ongoing research projects include issues in decolonizing theological education and formation, interfaith and interreligious peace initiatives, religion and nationalism, global Catholicism, and Christianity between colonialism and postcolonialism.